The study was conducted by German Govt. Update (February 12th, 2019): Xiaomi has reached out to us, and provided an explanation. From the official statement, it is clear that Xiaomi meets all radiation level rules in India. Mobile phones have become our lives. There are 4.77 billion mobile phone users in the world right now, and with such high usage of an electronic gadget, there is always a risk of radiation. In a recent study to find out which brands of smartphones emit maximum radiation, some shocking discoveries have been made. Xiaomi and Oneplus have emerged as the brands whose handsets emit maximum radiations. Which are these smartphones? Keep reading to find out more! 3 Why This List Is Important For Germany? 4 Are Radiations Bad For Humans? The German Federal Office for Radiation Protection (Bundesamt für Strahlenschutz) has conducted research to find out which brands of smartphones emit maximum radiation. OnePlus and Xiaomi, two of the largest smartphone companies have topped the list. The study was conducted on smartphone brands which were available since December 2018. Smartphones from brands such as Apple, BlackBerry, Google, HTC, Huawei, LG, Motorola, OnePlus, Samsung, Sony, Xiaomi and ZTE were considered for the study. 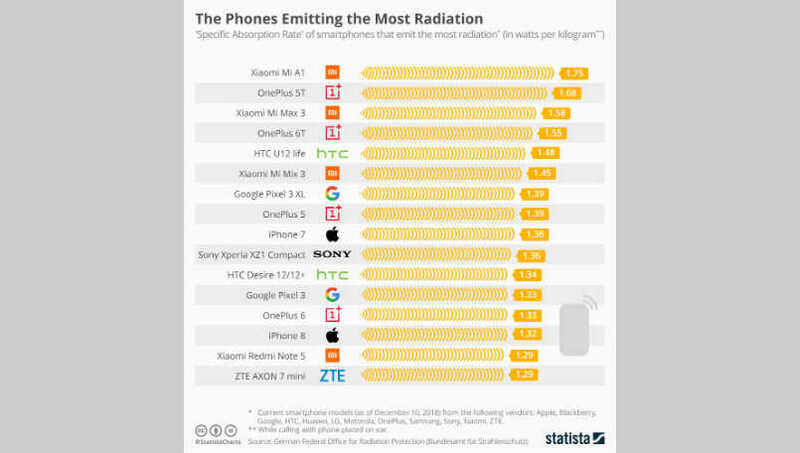 #1 in the list of smartphones which emit maximum radiations is Xiaomi Mi A1. At #2 is Oneplus 5T, while Mi Max 3 is at #3 position. Oneplus 6T, the iPhone killer in India, has been placed in #4 position. HTC U12 Life is at #5, while again Xiaomi’s Mi Mix 3 is at #6 position. iPhone 7 is placed at #9, while iPhone 8 is at #14. Samsung Galaxy Note 8, ZTE Axon Elite and LG G7 emit the least radiation. Why This List Is Important For Germany? As per German rules, smartphones shouldn’t emit radiation beyond a threshold. If any unit is found to be emitting radiation above that limit, then those smartphones are not allowed to be sold. The German certification for environmental friendliness, which is also known as ‘Der Blaue Engel’ (Blue Angel) certifies only those smartphones which have a specific absorption rate of less than 0.60 watts per kilogram. All the 16 smartphones listed in this list have more than double the value of radiation. Are Radiations Bad For Humans? Now, this is indeed a very controversial topic. As per studies conducted by World Health Organization, there is no immediate danger from cellphone radiation. More research and debate is required on this aspect, even as smartphone brands should take responsibility, and ensure that smartphones with high radiations are not allowed to reach the market. Do let us know your feedback, by commenting right here! "Xiaomi, OnePlus Phones Emit Maximum Radiation - Mi A1, OnePlus 5T, Mi Max 3 Top The List", 5 out of 5 based on 2 ratings.